Business casual dress codes have pervaded the workplace, and nowhere is that more relevant than the Bay Area. There's 'business casual', and what I call 'Bay Area business casual' - the most extreme version I've seen. Many local companies (especially tech) have a very lenient dress code - it essentially tells their employees to wear whatever they want - which results in a huge range from tailored separates to t-shirts and shorts. And this also results in many confused employees that want to fit in with the corporate culture, but also don't want to appear sloppy or less than professional. Over the past several weeks, I've worked with Amy - a married mom of two, whose recent work life has been consulting gigs. Amy contacted me because she just got a new job at a big Silicon Valley tech company, and had no idea how to navigate the vague information she had on what to wear to work. During her interviews, she wore her go-to work heels, but was asked if she was comfortable and could walk - so traditional pumps seemed a bit overdone. And, as a new employee, she really wanted to blend in - but she also wanted to be herself and utilize her existing wardrobe maximally. 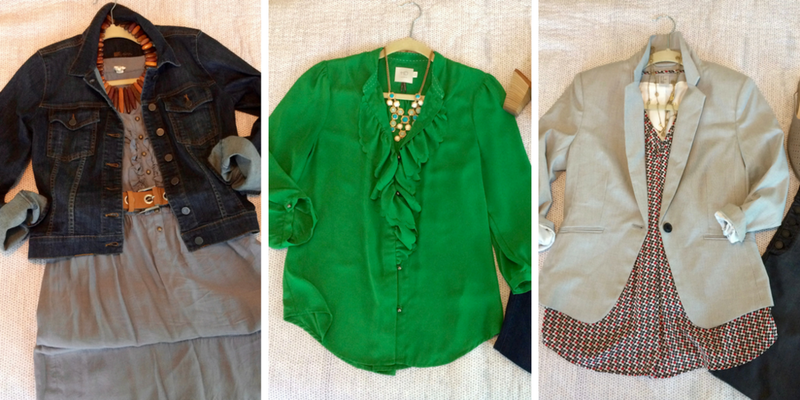 Since Amy was just starting her new job and didn't want to appear over or underdressed, we decided that pretty blouses (of which she already had several) and jeans would be her go-to work uniform. In previous jobs, she had worn these tops with tailored pants or pencil skirts - but for this very casual tech company, balancing the intricate details of these tops with simple denim downplayed their dressiness while still allowing Amy to express herself (and also use some of her wardrobe favorites). 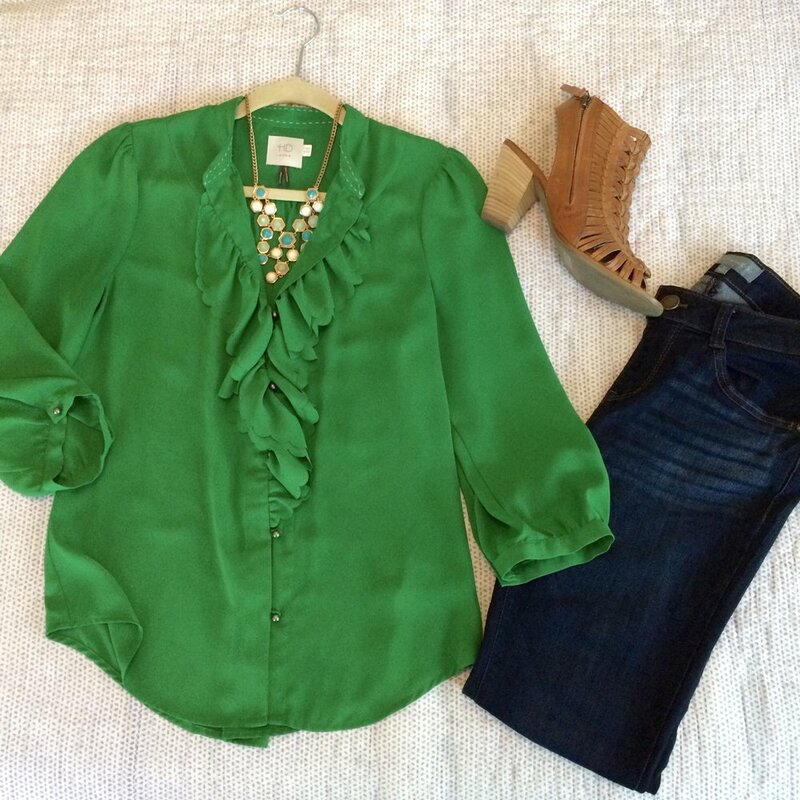 Amy loves this green blouse, and I love the combination of color and detail. I decided to play up the color with her statement necklace that doesn't precisely match, but enhances the green/blue palette of the outfit. Amy bought this lacy blush blouse in between our first shopping trip and our first styling session - and I'm so glad she found it! I paired it with olive jeans that we bought together - because even though we're using jeans as the basis of her work wardrobe, I didn't want to stick with blue denim as the only option. In addition to dark blue, we found dark grey, olive and burgundy as fun and unexpected choices. Amy is a creative person, and I didn't want to lose that as we transitioned her look to a casual office environment. And that's where the star-print statement sleeve wrap blouse comes in - it's whimsical and attention-getting, but in a completely professional yet informal way! 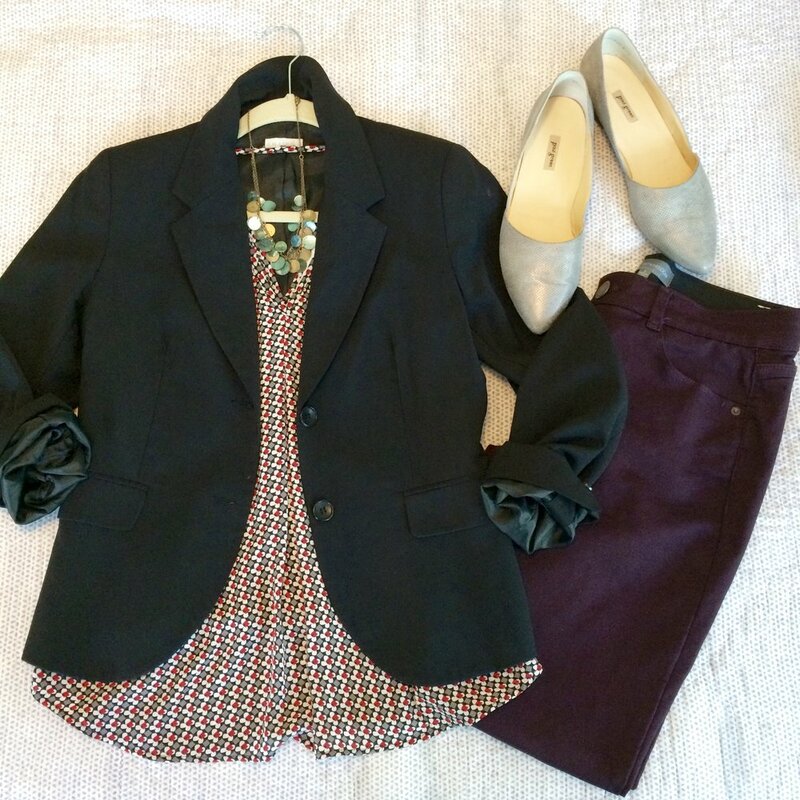 When Amy needs to (or wants to) crank it up just a notch, I created outfits teaming her traditional blazers with jeans and print tops, for something that's a little more authoritative, but completely within the realm of her 'Bay Area business casual' work style. The grey blazer, black blazer and print tops were already in Amy's closet before we started working together - so my job was showing her appropriate ways to wear them for her new position. A silky blouse and traditionally shaped blazer might feel a little stuffy for 'tech-casual', but with jeans and flats, they're pretty perfect. Can you wear jeans and a t-shirt to work? I say "yes!” if your office culture is very jeans-focused, and if you up the ante with a blazer, metallic flats and a sparkly necklace. 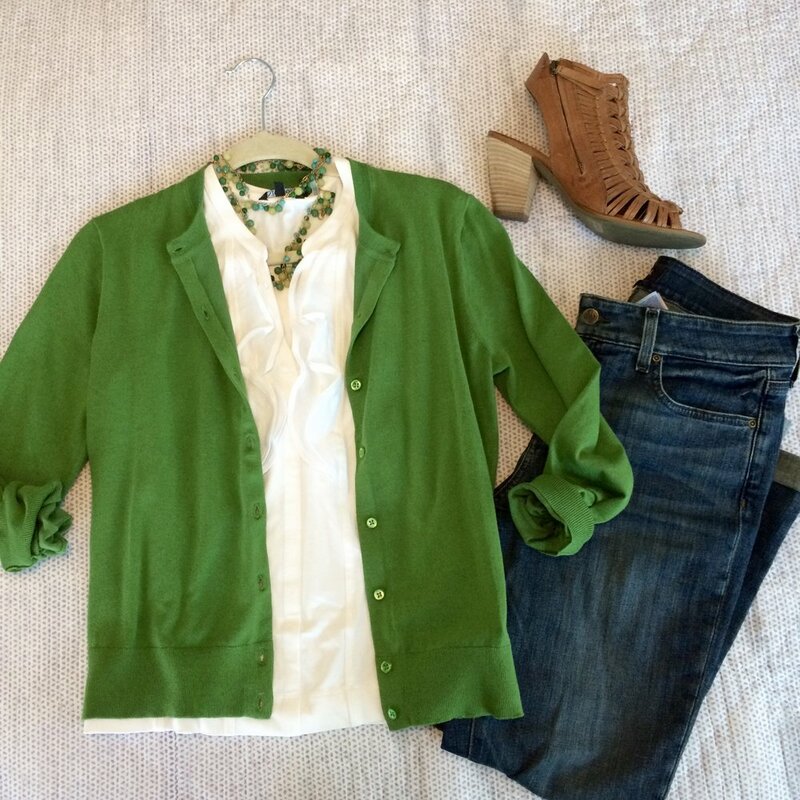 Amy wasn't big on cardigans, so I guided her to this one in a favorite color, as an option to her blazers for the office. A cardigan is a softer version of the ever-important 'third piece' and it's a great way to add a hit of color in an otherwise sedate look. I love how the cardigan plays off the shades of green in Amy's necklace - and the great thing (since the rest of the outfit is neutral) is that this could be any color cardigan that mimics the hues in any piece of jewelry. I also used the green cardigan to tone down one of Amy's favorite dresses - it softens the very feminine silhouette while maintaining the color story. And flats (as opposed to heels) keep it from feeling overdone for the office. Even though we purposely went with a jeans-based wardrobe for Amy's new job, that doesn't mean that she can't wear her dresses! Amy loves dresses, and her more casual ones can be outfitted to both fit in with her colleagues and express her personality in the workplace. This grey cotton dress is one of Amy's favorites - and a denim jacket is the ideal way to ensure it feels business casual appropriate. I also wanted to warm up the palette, so I paired it with a new belt and booties, and Amy's vintage wood necklace (that I'm gaga over!). Amy bought this striped midi-dress right before our styling session (it came with the leather belt) - so I simply added her uber-versatile denim jacket, and then flat sandals or open-toe booties, depending on her mood. 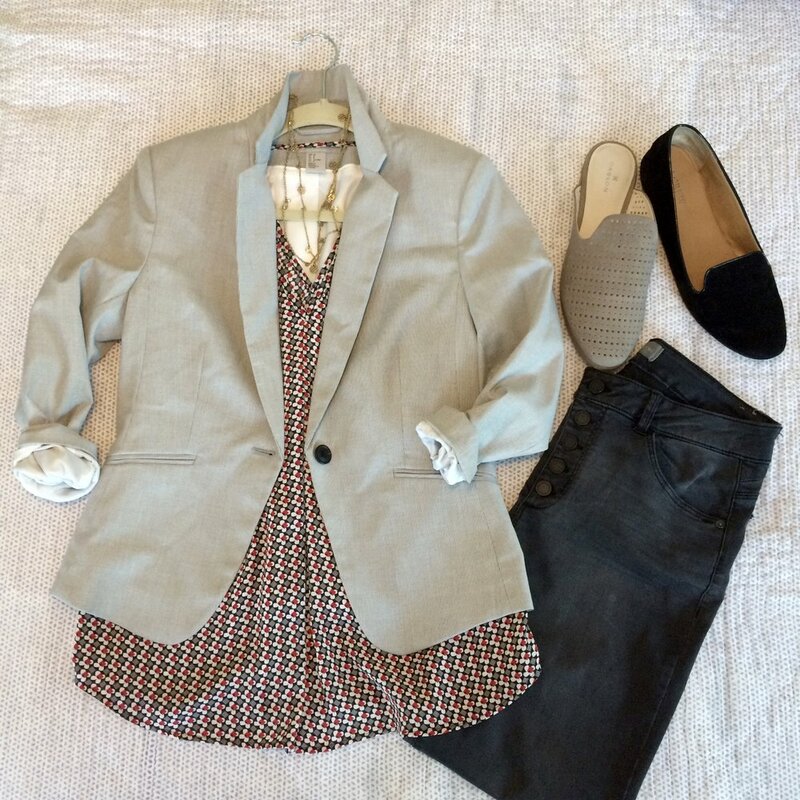 At first glance, this blazer and dress combo might feel like a little much for her office - but we're saving this one for fall. The dress is a bit short to wear barelegged - so we're planning this with tights and flat boots that will tame any overly dressy connotations. Amy had this crochet vest sitting in her closet, and I was looking for something to put over her jeans and new olive t-shirt (with an amazing drawstring detail that you can't see in the photo) - and voila, and outfit was created! And the point of this look is that you can wear special pieces from your closet to work, as long as the overall look is still professional and appropriate. Amy and I will continue to develop her wardrobe as the weather cools - and I can't wait to help her navigate her style in her new position, so that she feels confident and ready to conquer the day, everyday! Coincidentally enough, I heard from Amy the other day, and this is what she had to say about her outfit photos: "I have been meaning to write you, thank you so SO much for the wonderful look book! I absolutely love it and I use it every single day. I've told so many friends about it too, as it's made a huge difference in my life. I really had no idea how to dress or what was appropriate to go together before your help. And the look book takes so much stress out of finding an outfit every single day." If you need help navigating your office dress code, or you think it's time to step it up, email me so we can start the process.